UPDATED: Sat., Nov. 17, 2018, 10:40 p.m. 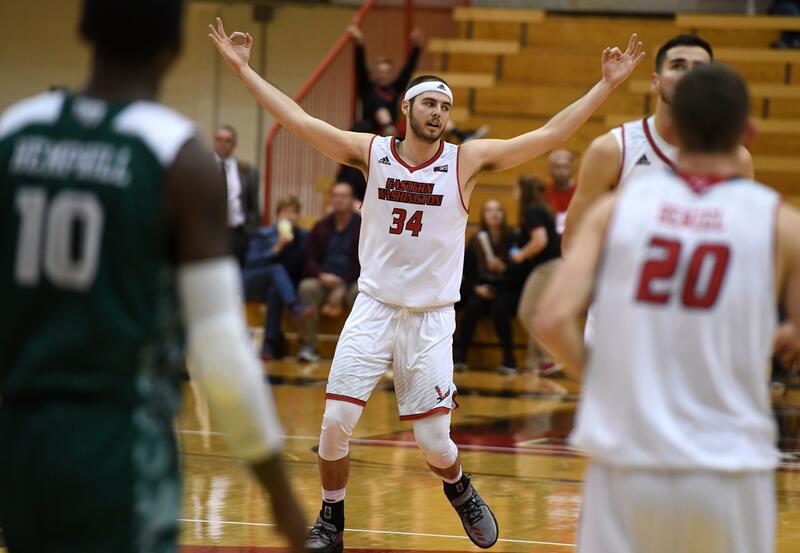 Wide open near the corner in the final minute of overtime, Eastern Washington forward Jesse Hunt squared up, hesitated, then remembered he had the hot hand. After his buzzer-beating 3-pointer forced the extra session, Hunt’s next three baskets helped the Eagles build a cushion they wouldn’t relinquish in a 87-80 win over Missouri-Kansas City on Saturday at Reese Court. But when the 6-foot-7 forward hoisted his final 3-pointer with 34 seconds left and early in the shot clock, it took a friendly bounce and stretched the Eagles’ lead to eight. It was that kind of night for Hunt, who enjoyed career highs of 32 points and 12 rebounds. EWU coach Shantay Legans said Hunt was on his way to All-Big Sky conference honors last season before an injury derailed him. Legans said Hunt,who had 15 points and 10 rebounds in Friday’s 82-78 overtime loss to Green Bay, is back on track. Playing in its second overtime in its many nights, EWU (1-3) let a second-half lead slip away. EWU guard Ty Gibson’s 3-pointer at the 8:53 mark gave the Eagles a 10-point lead, but UMKC guard Jamel Allen helped the Kangaroos chip away down the stretch. Allen hit back-to-back 3-pointers and four free throws to give UMKC a one-point lead, and Rob Whitfield’s late free throws put EWU in a 69-66 hole. Hunt scored inside to start overtime, and Gibson had a 3-pointer on the next possession for EWU, which never trailed in the extra session. Guard Xavier Bishop paced UMKC (0-5) with scoring a game-high 28 points, giving the Kangaroos a six-point lead midway through the first half. Gibson had 16 points and eight rebounds and Perry had 11 points for EWU. Luka Vulikic had six assists. EWU’s games against Green Bay and UMKC were part of the 2K Classic, in which the Eagles hosted a subregional of the eight-team tournament. The Eagles finished 1-3 in the tournament, also losing to Syracuse and Oregon in preliminary games the previous week. Published: Nov. 17, 2018, 8:34 p.m. Updated: Nov. 17, 2018, 10:40 p.m.